We have put some of the words that Erin has stumbled over in the past onto flash cards. Tonight Erin said that she wanted to practice them which we hadn’t done in a couple of weeks. She could name 15 of the 22 we had done in the past. She couldn’t recall tortilla or lasagna. 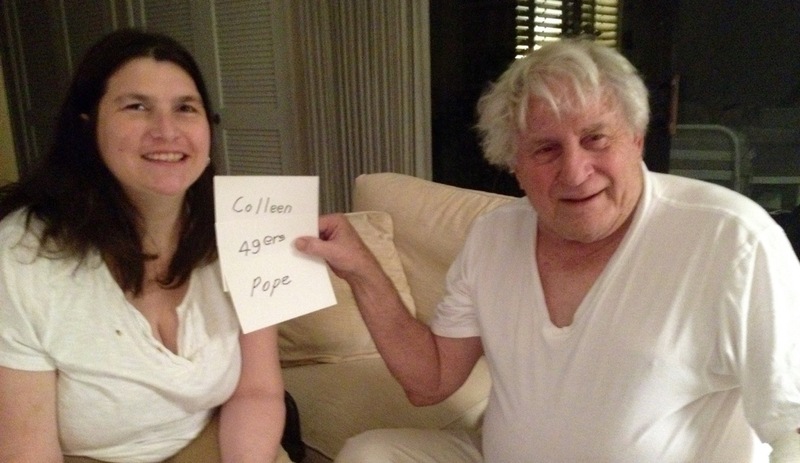 Then we added some new words like Colleen, 49ers and Pope which she could recite right away. She is completely baffled with Giants and months. It is very strange how the mind works. Erin and Shannon are shown as they are about to leave for the 2nd half of the birthday party for Vivian’s 3 year old son, Nico. Both Shan and Erin rave over how cute Vivian’s kids are. Erin came home tired, but happy and headed immediately to bed. But, soon came to have me look at the moon which she can see from her bed. it is very cloudy around the moon … related to tomorrow’s eclipse? Clark and I went to dinner at appropriately, La Rosa Blanca. Erin has been sleeping most of the past week, but today she was up early, scrambled her own egg before I even realized she was up, and made her own coffee. Then she made herself a cheese quesadilla and started watching TV with us in the living room. 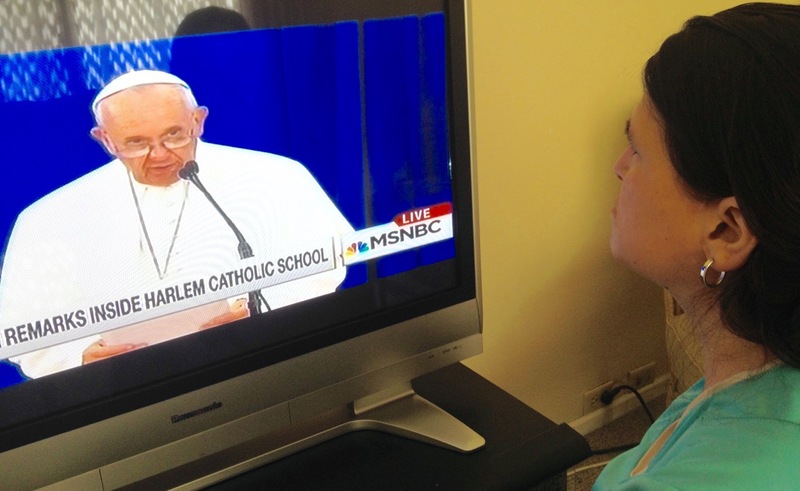 She was quite fascinated by the pope’s visit to the Queen of Angels school and hearing the spontaneous singing and the pope’s comments and ease with the students. There are tears in my eyes as I watch him greet special needs children at Madison Square Garden. 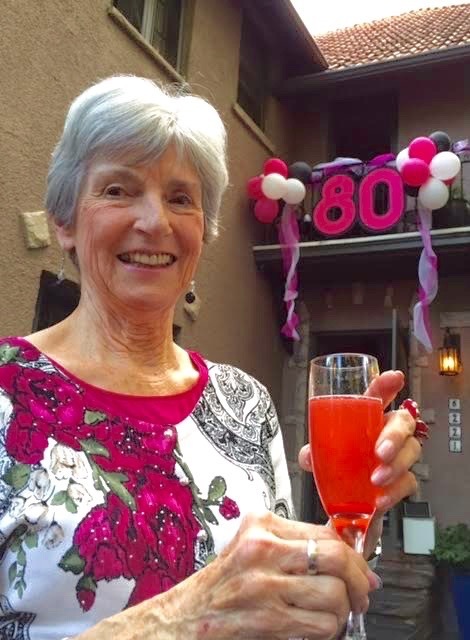 My sister, Erin’s Aunt Patricia, celebrated her 80th birthday yesterday, the 19th, in Denver with her 6 children, their spouses, 7 grandchildren, and Colleen and Deke, plus Sr. Anthony Marie, first cousin of Patricia’s late husband, Joe. 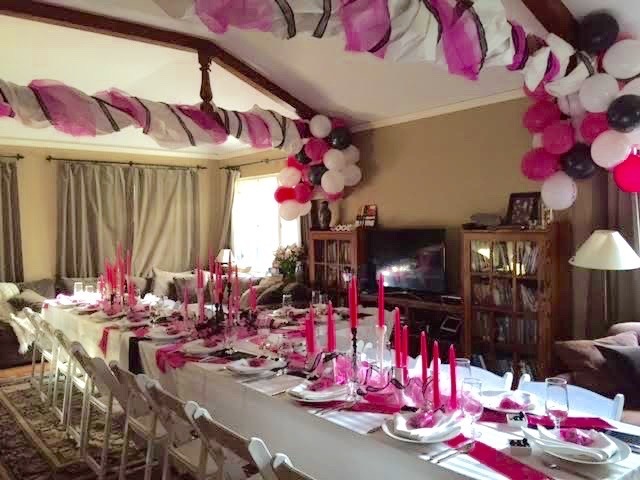 The party was at the home of her daughter Mary and her husband Greg. The title for this blog was suggested by Patricia’s 4th son, Tom, who sent me these photos. Tom is very clever and worked on these fabulous decorations as well as a 400 picture slide show. As Tom said, that’s some eighty year old, no? Later: Colleen here, editing to say a) it was an evening as lovely as its guest of honor, and b) hanging out with Zavadils is another great benefit of having moved to Colorado. 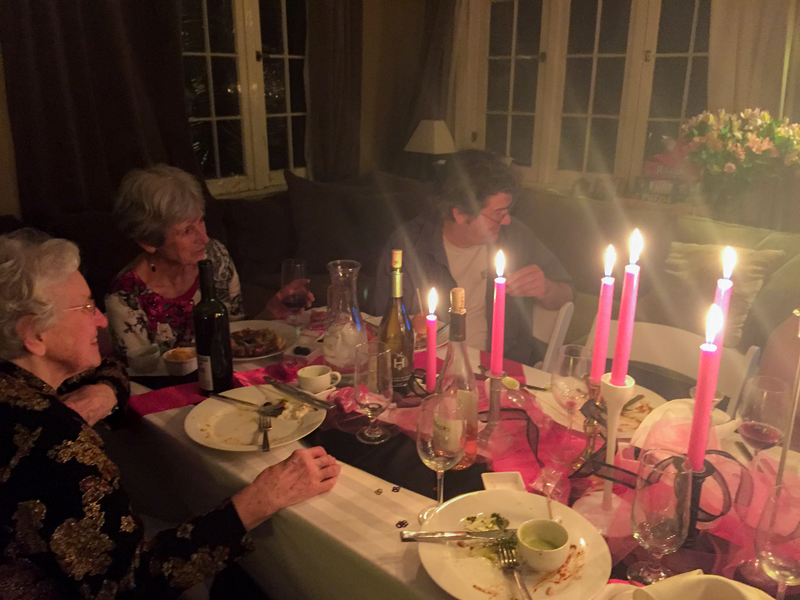 Here is a photo of the amazing table after the candles were lit, with Sister Anthony Marie, Aunt Patricia, and Joe watching the wonderful slide show. That’s my delicious avocado soup not quite finished in the foreground. Note how even though Patricia wasn’t allowed inside until dinner time (instead forced to sip magenta champagne cocktails and eat exquisite cheese on the lovely and similarly decorated patio), her outfit matched the surroundings meticulously. For those of you who have witnessed Zavadil reader’s theatre masterpieces before, know that this time the performers were the seven grandchildren singing a version of “Cover of the Rolling Stone” that had been customized, brilliantly, by Mary. 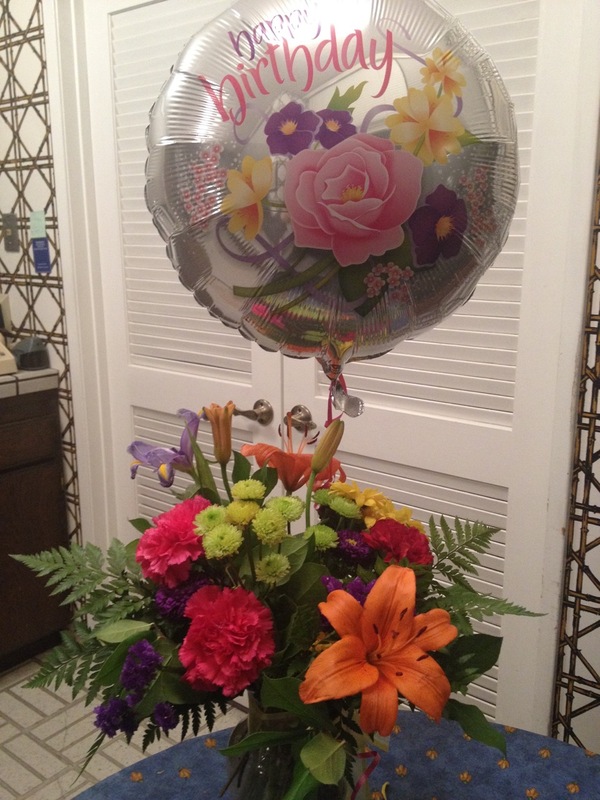 The flowers from the boys are still in perfect condition after 4 days. The orange day lilies remind us of Paco whose favorite color in orange. The instructions say to trim the stems and change the water every other day and add the floral preservative to the water. 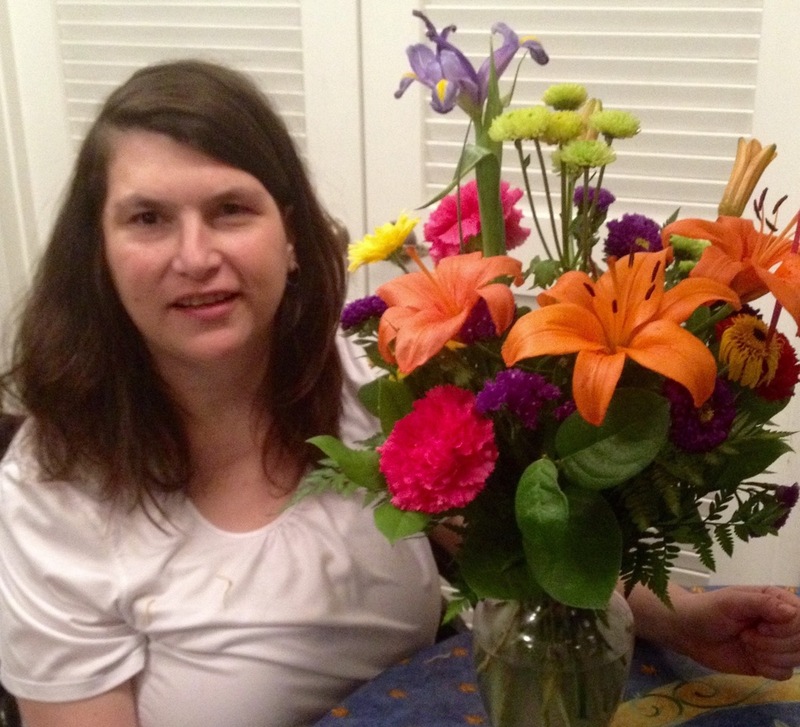 Erin suggested that I take another picture showing how well the flowers have lasted. The second picture is after I did the fresh up for the first time. The balloon was out of range in the first photo. Tonight Clark and I went to dinner at Cafe Bernardo in nearby Pavilions Shopping Center. Erin decided not to go with us, but had us bring home some mushroom salad and Mac ’n Cheese. It was a delightful evening for eating outside. I thought that it was about 80 degrees, but my phone said that it was 88. The mushroom salad and polenta with spinach tasted especially good. They hit the spot. 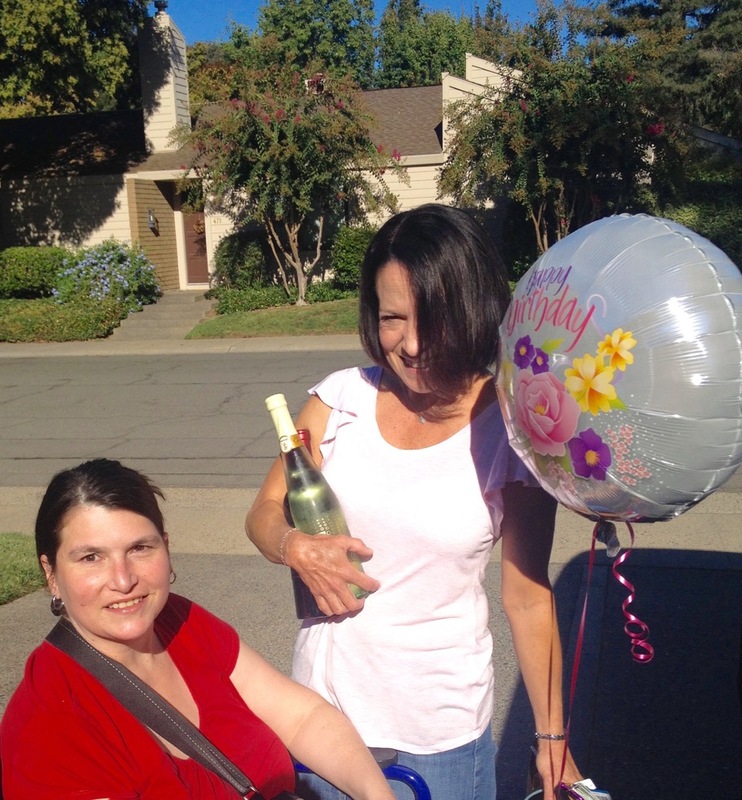 Erin extended her birthday celebration by going to dinner with Cindy and Shannon tonight. They went to 33rd St. Bistro on Folsom Blvd. Erin brought home half of her salmon club sandwich and shared it late in the evening with Clark. The 3 girls shared a peach cobbler dessert, which Erin said was delicious. Erin is fortunate to have such good friends. The cleaning ladies wanted to come today instead of their usual Tuesday, so we got out of the house by going for lunch at Cape Cod fish and chips, followed by a little shopping at nearby CVS. Brandon, Lisa, and Beck joined us for dinner at Ernesto’s Mexican Food downtown, and then we came back to the house for a Baskin-Robbins chocolate brownie ice cream dessert, which neither Erin nor Brandon partook of. I appreciated their joining us because they had a busy day yesterday belatedly celebrating Beck’s 6th birthday at a jump house. His cake was remarkable made by a former teaching colleague of Lisa’s. I’ll post a photo of it below.